I met Chef Jenna when our friend MJ- invited us to a Wine Tasting dinner at Amore’ Trattoria Italiana in Grand Rapids. It was an amazing dinner with Italian Wine Masters- sharing their organic wines… and the food was Incredible. We met the proprietors Mauricio and Jenna Arcidiacono- a young couple that opened this charming restaurant nearby our house. The Rest is History! 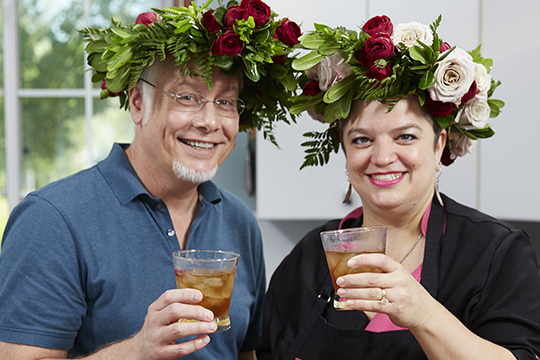 On this week’s Life in Bloom- Romantic Flowers Episode- Jenna joins me in the kitchen at home- where we create Rose- Infused Vodka- and we mix it up with Rose Spritzers and talk about Italian Traditions and break out the Flower Crowns! No matter what or when Chef Jenna and I meet up – it’s always Fun- with lots of Laughs! 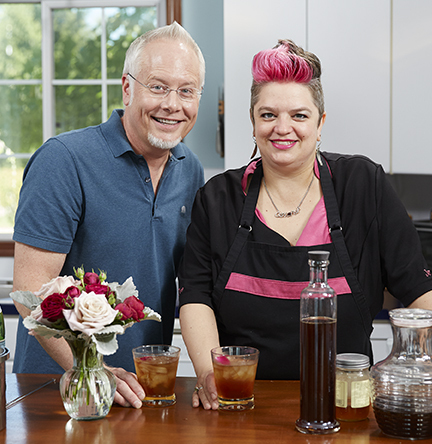 Chef Jenna Joins J in the kitchen to whip up some Rose Infused Vodka on Life in Bloom! Jenna and Mauricio – met in San Francisco- where they both worked in an Italian Restaurant “Mona Lisa” – they fell in love and married- and Mauricio took Jenna to live with his family back in Italy- Romantic… yes… but while Mauricio would go off to work – Newlywed Jenna stayed at home with his Mother- who spoke no English- and Jenna – No Italian. Quickly the Mother realized she would communicate to her new Daughter-in-law through cooking- and began to teach the young Jenna- Authentic Northern Italian Cooking- as a form of communication… Again- the Rest is History! 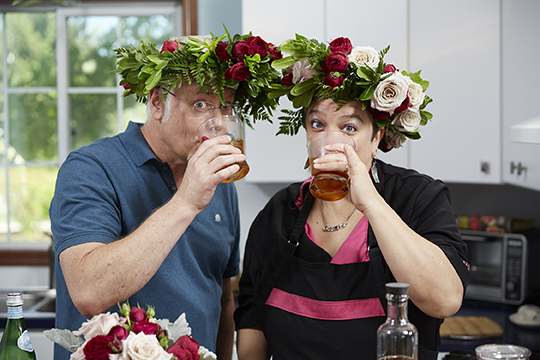 Chef Jenn and J try out the Rose Spritzers- made with Rose Infused Vodka! The couple moved back to Grand Rapids MI- Jenna’s home town started a family and a quaint Authentic Northern Italian Restaurant- Amore’ Trattoria Italiana- Amore’ for short! Now- let’s discuss the food- quite remarkably the finest Lasagna- I’ve ever eaten…As a family we have Jenna’s Lasagna for Christmas Eve every year and fight over the leftovers… The Involtini is out of this world… the Saltimbocca is … I can’t find the symbol for drool- in my emojis… everything on the menu is Superb… it’s impossible to find something on the menu- that is not GREAT! Fun Fact- Jenna is a Vegan- and so the menu offers wonderful delicious options for Vegans and Gluten Free diners as well… as I said… you’ve not been OUT- until you’ve gone out to Amore’ for dinner! 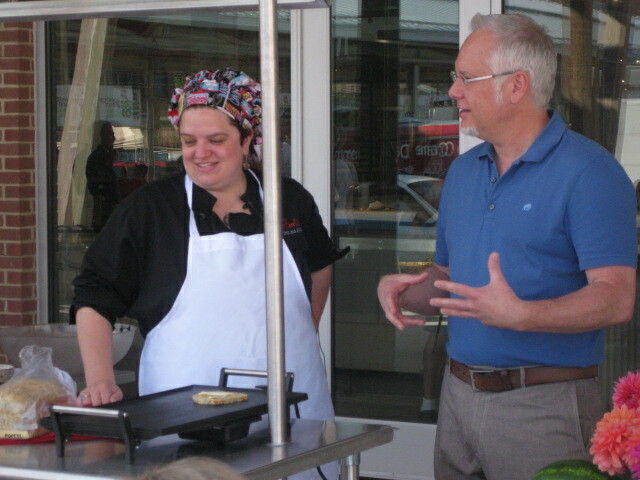 Chef Jenna and I – both appear on the Local ABC affiliate in Grand Rapids- WZZM- on the lifestyle show- My West Michigan- We’ve taught classes together at Amore’ – Chef Jenna shares her secrets to Northern Italian Cuisine- and I teach flower arranging during … we’ve also brought that little show to the Local Farmer’s Market. 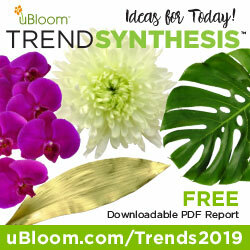 Jenna has participated and WON- our Annual uBloom Local Celebrity Flower Power Challenge- (you’ll see that very event in an upcoming Life in Bloom Show)… and she’s guested on my Fun with Flowers and J on uBloom! Kelly and I had our wedding reception at Amore’- thanks to our Best Friend Suzanne – that threw a party for our Friends- who dined on Authentic Northern Italian deliciousness- while serenaded by the John Shea Jazz Trio… amidst plenty of gorgeous flowers… and a Cheesecake Wedding Cake- complete with 2 Prince Charmings… it was one of the most incredible nights of our lives… Thanks to amazing Friends! 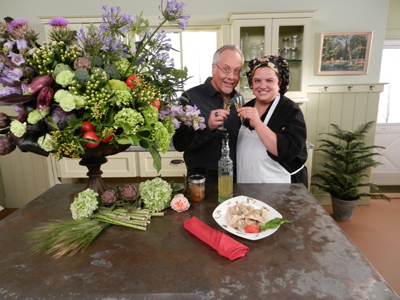 Chef Jenna’s first appearance on Fun with Flowers and J! Jenna has created her World Famous Authentic Italian Dishes for celebrities – like Snoop Dogg, Cindy Crawford, Nichelle Nichols and … Me! hehehe! The Pictures hang in the foyer of this charming Trattoria – where people visit, eat and drink in the atmosphere- and enjoy ‘gifts from the Kitchen’ – like Spoons of Tiramisu – or Chocolate-cello… and Chef Jenna makes the rounds to every table- to share a laugh- hug- and make sure your experience is over the moon! Check out Jenna’s recipe for Rose-cello- made with organic garden roses in my Book- Fun with Flowers!